Note: Due to recent changes at TxDOT, we are unfortunately not able to provide camera feeds for the State of Texas. RoadCam is a traffic camera viewer that lets users check road conditions in dozens of U.S. states and countries around the world. Tap a button to download your preferred region, then have hundreds of cameras at your fingertips! Just in time for the holiday driving season, RoadCam can help you make better driving decisions before you leave your house. Check the list below to see if your state is supported. If your city/state/country isn't listed yet then be sure to download the app and contact us inside the built in help section. We add new regions each week! Save your commonly used cameras and access them with a simple touch. 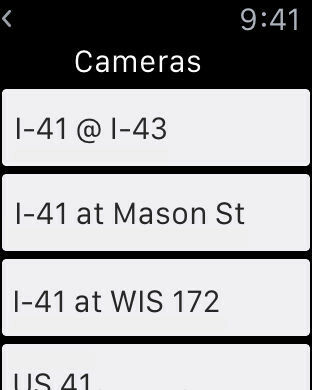 This feature is great for people using RoadCam with their daily commute or other frequently used trips. In certain states we offer our RoadCam Live services (additional subscription required). 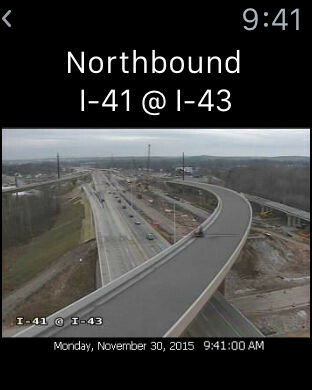 Quickly get realtime traffic information including accidents, incidents, construction and weather alerts. We created RoadCam after traveling throughout the United States. Our road trip took us through 25 states and required us to download a separate traffic camera app for each individual state! More often than not, the apps didn't work perfectly and left a lot to be desired. RoadCam was created for frequent road travelers who want all of their cameras in one single app with the ability to save favorites cameras and routes. RoadCam is a tool to help you evaluate driving conditions around the state. When planning travel during adverse conditions please consult with your transportation authority for the latest weather conditions and do not rely on this app alone. Please do not use this app while driving. Use of RoadCam is meant for passenger use or pre-trip planning purposes outside of your vehicle. Generally RoadCam provides STILL images which are updated every 1-5 minutes, although certain cameras may take longer. We have no control over the timing of the images. This app is not affiliated with any local/state/federal transportation authority. Images are courtesy of individual transportation departments around the world.